Whilst I may be in a relationship now, there were many years that were spent being single where as such V-Day seemed a little daunting. Lets face it, romantic relationships can be fleeting and messy (at least in my case) and being single on this day can affect some more than others. 9 times out of 10 your best girlies will be there for you through thick and thin, when you need a hug or pre-date pep talk so why not celebrate this. Even with a boyfriend, I think I wouldn’t mind spending it with my friends instead (sorry L J ) I don’t know about you but I have personally unlocked my true dance potential with my BFF Poppy, the dinosaur dance as we like to call it. If that isn’t friendship and a real reason to celebrate I don’t know what is. What’s my favourite way to spend Galentine’s Day? It would 100% be a girls night in. The ultimate girls night in for me involves ordering pizza and having a relationship with two men simultaneously; Ben & Jerry 😂 The only two men allowed to enter this scenario full stop. It doesn’t stop there either. Cue matching pjs, heart shaped chocolates, macaroons and sheet face masks. Not forgetting the playlist of powerful female anthems. Dua Lipa’s “New Rules” springs to mind. Any other empowering tunes will be greatly appreciated. I can see a Spotify playlist in the making. 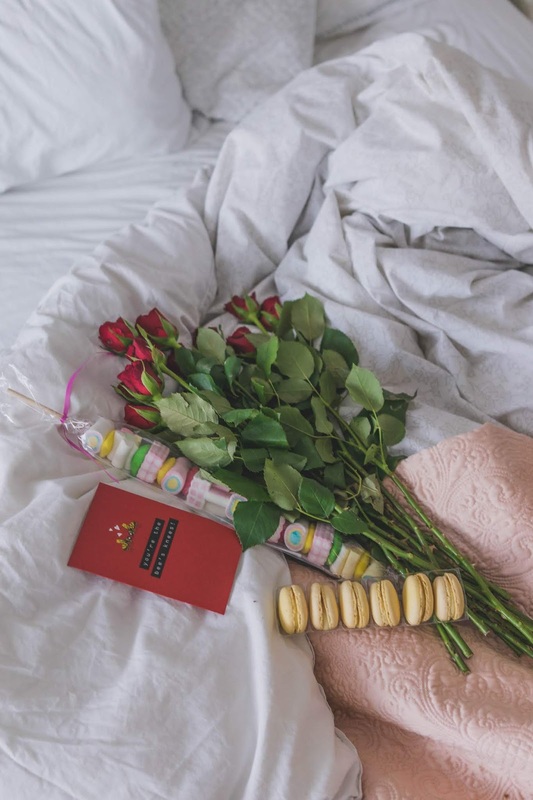 All of the items featured in this post (pjs, dressing gown, face masks, cards, chocolates, socks, clutch bags, and macaroons) were purchased from my local T K Maxx and make super cute gifts for your BFF’s, don’t you think? The best part is you don’t have to break the bank either (some items up to 60% off RRP!). When it comes to buying gifts, I always think it’s nice to go into store and hand pick things yourself. 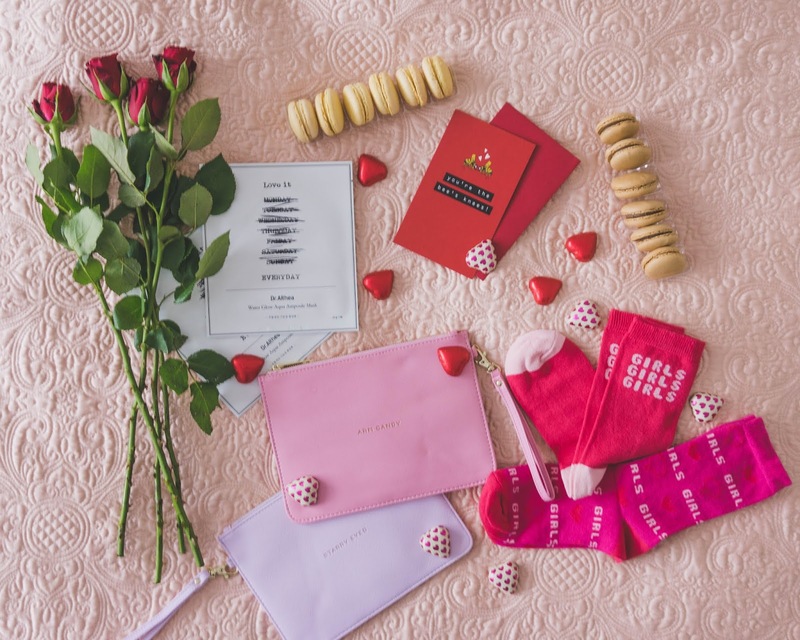 From pjs to cocktail shakers you can pick up some quirky gifts with your BFF in mind and T K Maxx also have so many one offs available in store that make present exchanging this G/Valentine’s Day that little bit more special. I couldn’t resist these matching heart pjs which I’ll definitely be wearing after the Galentine’s Day celebrations too. I snapped them up for only £12.99 each too! There’s nothing better than reminiscing on old memories and of course making plans for the future…a holiday of course. All of which should be done eating sugar coated foods. I devoured these vanilla and coffee flavoured macaroons and our fingers were left very sticky after this insane marshmallow stick. So not matter what you do this Galentine’s Day, treat your BFF to the best day ever and show them some love. If you are stuck for ideas this G/Valentine’s Day I would definitely recommend heading to T K Maxx. From candles to pjs and sparkly jewellery the present ideas really are endless. Once it’s gone, it’s really gone. What are you G/Valentine’s Day plans? This post was sponsored by T K Maxx. All words, styling and photography are my own.